We have a customer looking to interface his UR with a Haas and a Doosan CNC. Has anybody ever done that? Any advice? @Enric can you share your experience? The connection has been through digital inputs and digital outputs. Two solenoides (digital outputs UR10) actived cylinder to open and close the door of the CNC. Thanks @Enric , that sounds so simple! Did you had any challenges when it came to interfacing the I/O's ? I guess the UR program send the Cycle_start and wait for Running(cycle) to be off ? To CNC exist signal "jaw" closed (with part) and "jaw" open (without part). And this "jaw" open and close with only one signal. You need a program example? 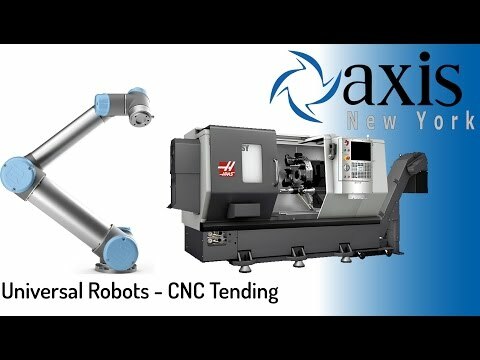 Here is another video showing a UR with a HAAS CNC. @Kevin_Matthews can you tell us more about this? For this application, the goal was to make a semi-permanent connection for a demo show. Ideally, a serial connection would have been the best communication but I was able to use Digital and Analog IO to accomplish just about everything I needed. Chuck: There was a foot-pedal connection that would work at anytime, regardless of machine in/out of cycle, door open/closed. So I ran a Digital output through a 24V relay mounted in the UR controller housing to the connector in the main control panel of the HAAS. (If I recall, it was connection M19, though not sure). Cycle start: Again to remain semi-permanent and not loose any usual CNC control, I again wired a digital output through a 24V relay and tied in directly with the HAAS cycle start button. This allowed for the button to be used as normal, or the robot could "emulate" a button press to start cycle. I asked the CNC programmed to give me some "cycle done" signal but they weren't sure exactly how to do that, so I got creative and tapped into the stack light. When a machining cycle is done on the HAAS, the stack light goes from solid green to flashing green. This however, is on a 5V circuit. To read this voltage I picked off inline with the stack light green power and Common and ran into an Analog input into the UR. Do to my lengthy wire and my direct pick-off, I had created a voltage divider, so at maximum I received around 2.8~2.9 Volts at my input so the logic in my program would wait for that signal to pass my high threshold, then wait for it to go low again. This way I knew the light had gone from High to Low, telling the robot the "cycle was done". The door was a bit of a challenge to open with the UR5, it took a little finesse to tune the speed and acceleration such that the door wouldn't "bounce" (as slightly seen in the video) and fault the robot for over torque. The trick was to leave the gripper about 1mm more open then the handle diameter to allow a little movement but not too much. Another trick was to turn the acceleration down but the speed up. This reduced the 'jerk' but still had the momentum to force the spring-roller type assisted door to move at the UR's pace. Since the HAAS was not outputting any additional signals, the robot was the master as though it was a human operating the machine. It appears that the machinery you showed above is a Gooway and a Haas. How did you tie your inputs/outputs to the Doosan CNC? Did you use the spare m-code relay contacts or the robot interface card? Or are you aware of another option? Doosan’s usually have 4 spare M-codes M91-M94. Once you are connected to the machine You can use your M91 to trigger the arm and use an M10 & M11 to actuate your chuck. If you want the UR to cycle start you will need to tie into cycle start button. One issue I ran into was, the door interlock and the chuck open an close commands are tied together. I had to disable my door interlock to allow the M-codes to work properly. I resolved the issue by having Doosan change the latter software in the machine. Here is an example of the cnc code at the end of the program.